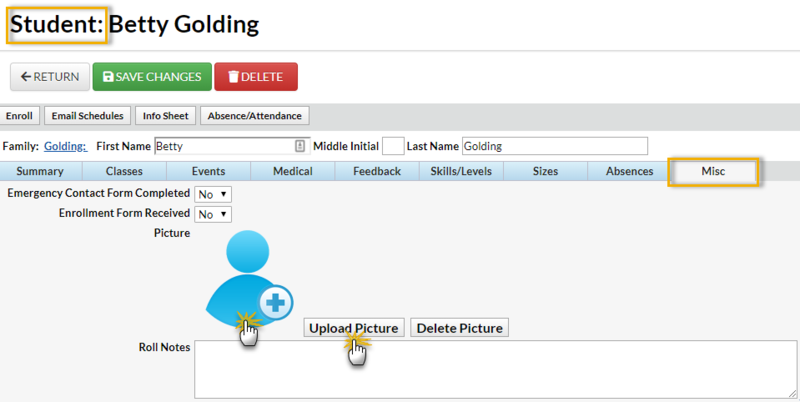 You can add a student's picture to their Student record under the Misc tab. The photo should be no larger than 1 MB. Pictures that are approximately 300 pixels in height & width work best. Go to the Student record and select the Misc tab. Click the Upload Picture button. Locate the student's picture on your computer. Select the picture and click the Upload button. Once uploaded, the picture will display on the page. If you are utilizing Jackrabbit's Staff Portal feature, your staff are able to upload a student's photo from the Manage Classes page of the Staff Portal. 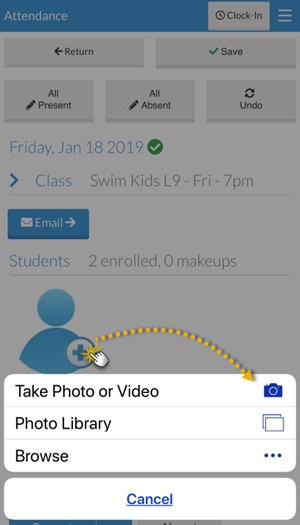 When the Staff Portal is launched from a smart device, such as an iPad or iPhone, staff can take a student's photo and upload it on the spot!